Our main objective is to provide regular competitive, challenging, fun and affordable junior golf competitions across the UK. Host a UK National Grand Final. Give players the opportunity to play in competitions in different parts of the world. Help every child enjoy the sport of golf. The British Junior Golf Tour was started when its founder, Steve Adams, discovered a shortage of junior events for his son to play in when aged five. Steve felt that it would be more enjoyable for his son to play against juniors his own age rather than much older and bigger players, so the concept was born and the Tour was set up in 2005. Since then, BJGT has provided a platform for juniors to test themselves against their peers, with many going on to represent England and into the professional ranks. At most events which are run by the BJGT team on the day, Steve will usually be the starter on the 1st tee, as well as the face that you will see at the scoring desk and the one conducting the trophy presentations. Steve's partner, Julie, also helps out on the day at most events, setting up and taking down BJGT signage and running the registration desk, and occasionally helping out with photography. 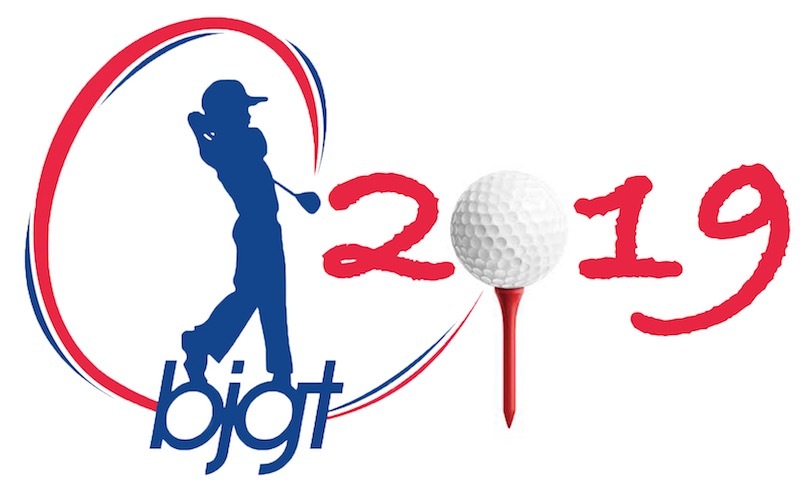 In 2016, Neil Randall, a low single figure handicap golfer and parent to a junior golfer, joined forces with Steve to revamp the BJGT, and working together, the tour is going from strength to strength. Neil built and runs the website (including bookings, payments, etc. ), is the head photographer for the BJGT, designs all the banners, posters, trophies, etc, and works with Steve, Julie, and Delia to deliver junior golf tournaments of the highest quality. Delia (Neil’s wife, pictured here with one of our Tour Ambassadors, Harry Judd) helps out with much of the work behind the scenes. She also runs the social media for the BJGT, acts as media liaison, and takes photographs on the day at most events. The British Junior Golf Tour has junior golf at its heart, a not-for-profit company whose sole aim is to increase the opportunities for young golfers to show just how good they are. As one of the few organisations in the UK to promote the use of caddies, we are encouraging families to come out and enjoy the game together. We take great pride in playing a small role in establishing each youngster’s lifelong passion for golf.